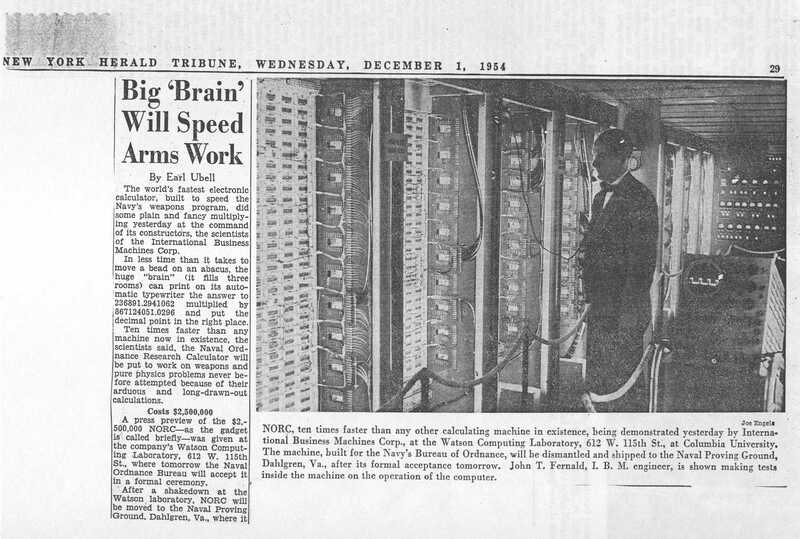 Caption: NORC, ten times faster than any other calculating machine in existence, being demonstrated yesterday by International Business Machines Corp., at the Watson Computing Laboratory, 612 W. 115th St., at Columbia University. The machine, built for the Navy's Bureau of Ordnance, will be dismantled and shipped to the Naval Proving Ground, Dahlgren, Va., after its formal acceptance tomorrow. John T. Fernald, I.B.M. engineer, is shown making tests inside the machine on the operation of the computer. The world's fastest electronic calculator, built to speed the Navy's weapons program, did some plain and fancy multiplying yesterday at the command of its constructors, the scientists of the International Business Machines Corporation. In less time than it takes to move a bead on an abacus, the huge "brain" (it fills three rooms) can print on its automatic typewriter the answer to 236891.2941062 multiplied by 867124051.0296 and put the decimal point in the right place. Ten times faster than any machine now in existence, the scientists said, the Naval Ordnance Research Calculator will be put to work on weapons and pure physics problems never before attempted because of their arduous and long-drawn-out calculations. A press preview of the $2,500,000 NORC—as the gadget is called briefly—was given at the company's Watson Computing Laboratory, 612 W. 115th St., where tomorrow the Naval Ordnance Bureau will accept it in a formal ceremony. After a shakedown at the Watson Laboratory, NORC will be moved to the Naval Proving Ground, Dahlgren, Va., where it will be used by other government agencies as well as the Navy. NORC can add, subtract, multiply, and divide faster than any other machine, and smart mathematicians can combine these four simple arithmetic processes to solve the most subtle and difficult equations. One of the first problems that will be given to NORC will be that of cavitation. Cavitation is is the development of a large air bubble around a torpedo when it splashes into the water. Until now only experiments, taking many months, could determine the size of the cavity which could easily disrupt the course of the torpedo. NORC should be able to figure the size in a week or two. NORC will solve this problem with 7,000 radio tubes, sixty-seven electronic "memories," a half dozen high speed tape recorders, a seemingly tangled mass or air-conditioned wiring, push-buttons galore and enough flashing red and green lights for a dozen Christmas trees. Byron L. Havens, forty-year-old electrical engineer who headed the team that built the machine, said the scientists strove for speed in computation. On the IBM 701, another calculating giant, a problem that would take it a year can be done in a month on NORC. NORC, the scientists said, handles on a decimal basis; an individual operation takes one-millionth of a second; multiplying is a separate operation rather than a series of additions. Punch cards put the instructions and problem on magnetic tapes which then instruct the machine with electrical impulses. NORC, the world's fastest calculating machine, was said yesterday to be capable of predicting weather for an entire hemisphere for thirty to sixty days by a mathematical calculation taking about one day to complete. Dr. John Von Neumann, mathematician and newly appointed Atomic Energy Commissioner, listed three other jobs only the Naval Ordnance Research Computer (NORC) could do because of its ten-fold speed advantage over any other electronic brain now in existence. Dr. Von Neumann spoke at ceremonies at which the Navy formally took over the machine from its constructors, the International Business Machines Corp., at the company's Watson Computing Laboratory, 612 W. 115th St.
Compute the tidal motions of the entire Atlantic and Pacific Oceans as well as local variations in inland seas and bays along the continental littoral. Throw new light on the core of the earth, believed to be liquid, by computing the turbulent motion at the center. Help the Armed Forces plan movement of men and materials under all conditions by mathematically simulating logistical problems. Dr. Von Neumann said that such problems, including the one on weather, involved such drawn out and tedious computations that no dared even attempt them. He is particularly familiar with the weather problem. At the Institute for Advanced Studies, Princeton, N.J., where he is a professor, Dr. Von Neumann has been part of a research team that has attempted to express the temperature, pressure, humidity and motion of the atmosphere by mathematical equations, then solve those equations by machine to make weather predictions. The ultimate advantage of this method over thta used by all weather bureaus would be to eliminate many of the guesses by forecasters and reduce their current 15 percent error. Dr. Von Neumann pointed out that with previous machines the calculations, after the information had been fed into them, took twenty-four hours for a twenty-four-hour weather prediction, with no increase in accuracy over the "subjective" forecaster. With NORC, the calculation will take between three and four minutes, but Dr. Von Neumann suggested that a more profitable calculation would be the thirty to sixty day forecast for the entire hemisphere, which would take twenty-four hours.